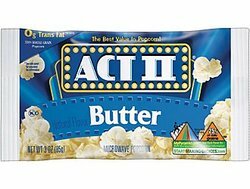 ACT II Microwave Popcorn. Individual bags, approximately 3 oz per bag, designed for the microwave. Order Individually or 36 at a time for full cases. Enjoy!